Francisco Migoya from the CIA (the Culinary Institute of America, not the other CIA) is a superb pastry chef and judging from his books, an excellent teacher. He has 3 books and I got a hold of two of them so far, Elements of Desserts and Frozen Desserts. While I have many high end, modern and professional cookbooks, until I got Migoya’s books, I really did not have any pastry and dessert books that target the professional cook. If you want to go beyond desserts tailored for the home cook and learn the way modern pastry chefs compose and create desserts, these are the books for you. They are geared towards the professional chefs and deal with everything from the basics of desserts, the professional tools of the trades, running a pastry kitchen and of course many beautiful modern desserts. I love reading through those books, looking at all the gorgeous pictures and learn a few things about the creative process, especially for plated desserts like this one here. The flavors are not strange or foreign , just a few primary flavors that work very well together and a modern unique plating. Migoya instructs that no more than three primary flavors should be included in a dessert or else the palate would be overwhelmed. 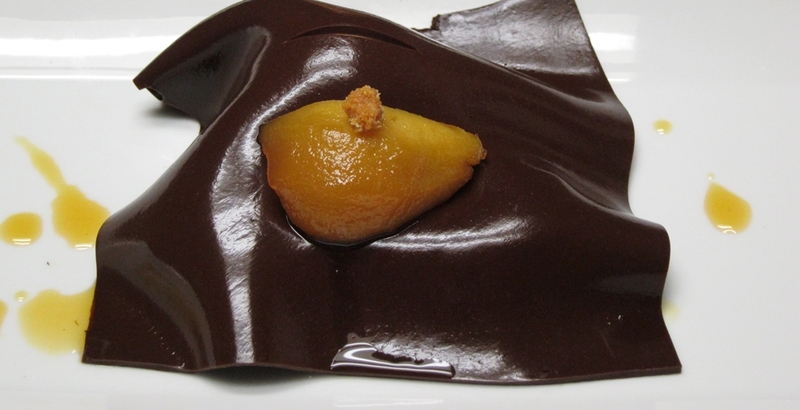 This plate combined pear in the form of ice cream and poached fruit, almond Genoa bread accented with caramel and chocolate in the form of a cool “veil”. This was my first time trying Genoa bread (aka Pain de Genes) even though I’ve read about it from many sources. It is a cake of sorts made with a lot of almond paste that gives it a wonderful flavor and a dense almost fudgy texture. 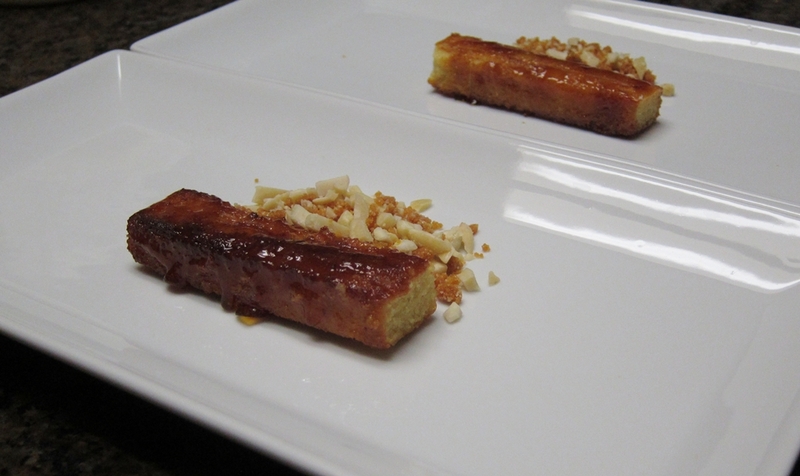 This makes it ideal as a refined “cake” or building block for plated desserts. It can be flavored with anything from pistachio to black sesame or chocolate. This particular one is flavored with almond praline. I made the praline by cooking almonds with caramelized sugar and pulverizing the mixture. After baking the cake in a sheet pan I cut it into rectangles. Right before serving the bread gets a nice layer of caramel. The process sounds easy but is a bit tricky. It involves melting sugar till it is a dark amber caramel and then rolling the bread rectangles in it to get a thin coating of caramel on all sides. Well, rolling pieces of cake in a liquid lava is no easy feat. I managed to do it but the caramel was a bit thicker than it should be. Still it was a delicious crunchy counterpoint to the sweet soft cake it enveloped. The recipe also includes a pear ice cream (in my book almost any dessert recipe should include a frozen concoction of some sort!). It’s a straightforward ice cream made using pear puree, cream, yolks,…I had no pear puree and decided to make my own. I just cooked some peeled Bosc pears sous vide with about 10% of their weight sugar until fully tender. Then I pureed them, weighed what I needed and froze the rest for another batch later on. 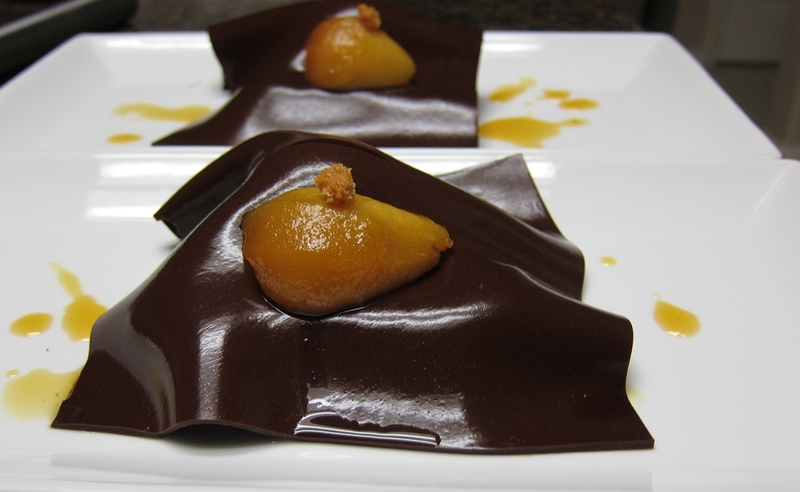 The other pear element is caramel-poached Seckel pears. These are those cute small pears about the size of a large chicken egg. To caramel-poach them I made a caramel using sugar and pear cider. I peeled and cored the small pears then cooked them in the caramel until soft and took on a lovely deep color. These were cut into quarters and reserved until serving time. It’s really fascinating to me how a final small touch could elevate a dessert of poached fruit, cake and ice cream. 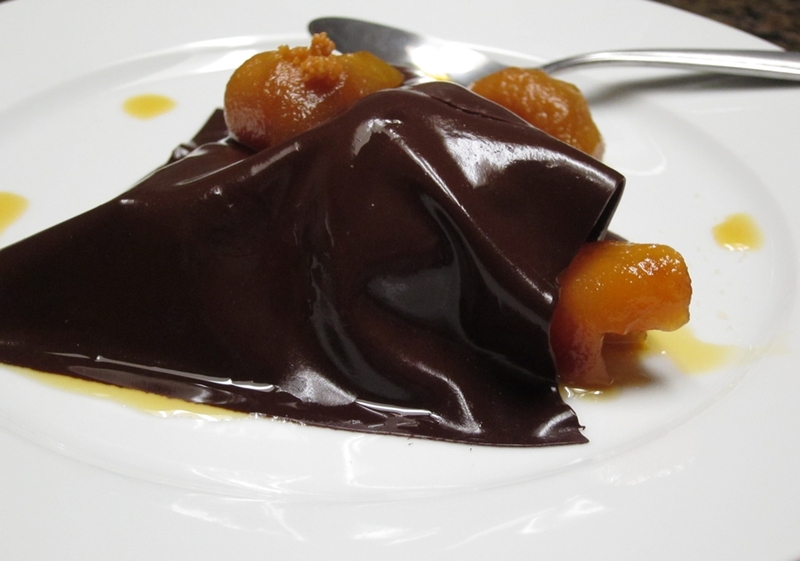 I’m referring to what Migoya calls a “veil” here made of chocolate. He uses this techniques in a few recipes in the book incorporating a variety of flavors. It’s basically a solid sauce that covers the dessert components and adds it’s own texture and taste. To make the veil a cocoa nib stock (cocoa nibs steeped in hot water) is mixed with cocoa powder, sugar and low-acyl gellan gum (a gelling agent). This is then poured in a sheet pan until set and then cut into large squares that get draped over the plated components. I was really worried about this step and figured it might get to be very tricky but overall it was pretty straightforward and worked well. The cut chocolate veil squares keep very well for a few days between squares of acetate in a tightly closed container in the fridge. 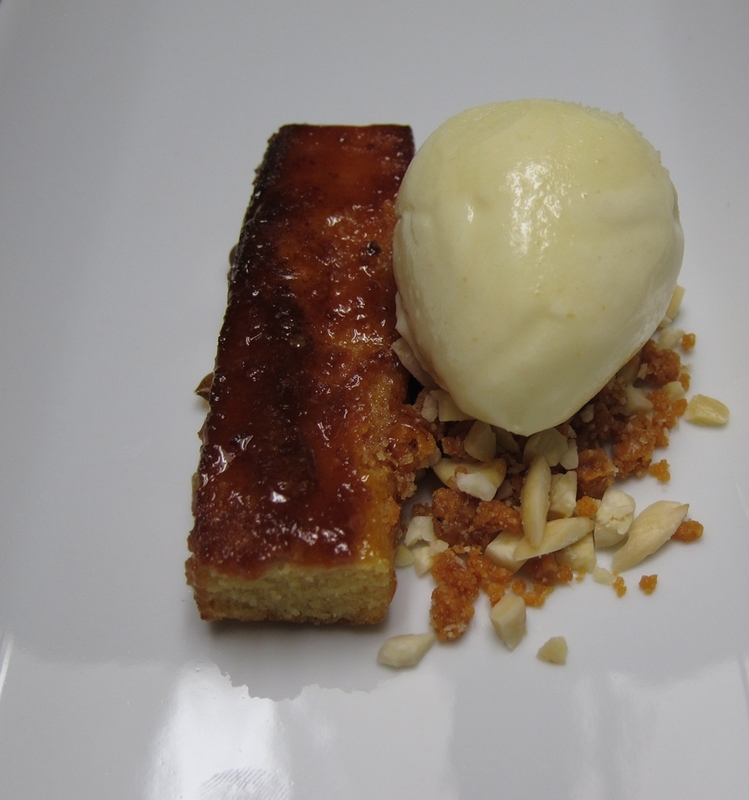 To plate, I put a pile of crumbled caramelized genoa bread and almonds next to a piece of the cake and used that as an anchor for the ice cream. The whole thing gets covered in a chocolate veil and topped with a piece of the fruit. A small cut with a paring knife on the veil reveals the ice cream underneath it. The finished plate is as delicious as it is beautiful. It has a perfect combination of textures and flavors from the bitter to the nutty and sweet. Hi. 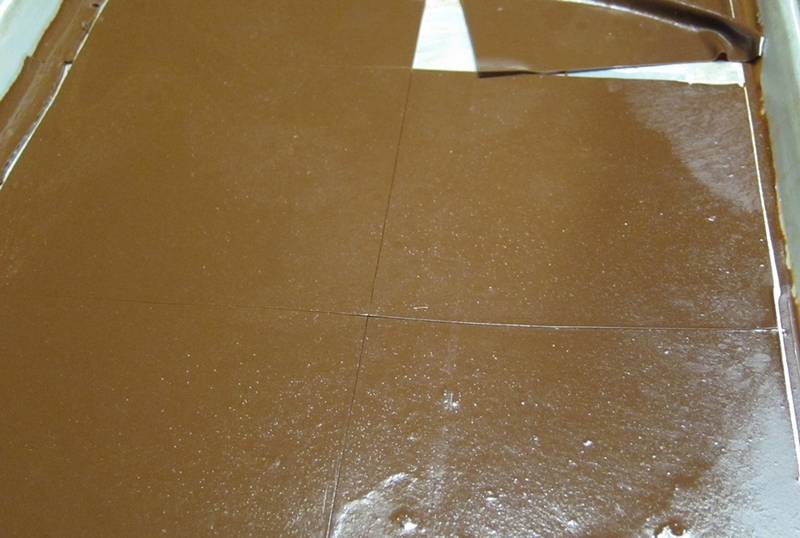 Do you think that using other gelling agent (like agar) would make for that excellent chocolate layer? I’m sure some other hydrocolloid (or combination) would work, but I’d be concerned about the flexibility of the “veil”. Agar might do the trick, but it usually produces very brittle gels so it might not “drape” properly. Low-acyl Gellan made a flexible and sturdy layer. Hi, I found your blog via eGullet. I just wanted to say for caramelising the Genoa bread, an alternative method is to make caramel, pour onto a greased silicone sheet, let harden, then process to a powder. 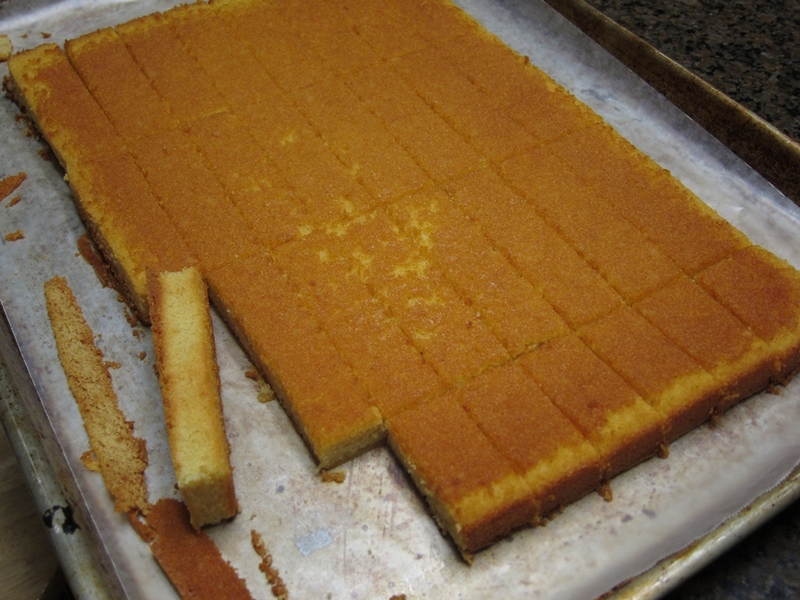 You can then brush clarified butter lightly onto each cake rectangle and roll it around in the caramel powder to coat. Then just (re)caramelise them on a hot pan. The chocolate veil is beautiful in this recipe, thank you for sharing. Thanks for the tip Niall. It makes sense. I’ll give it a shot next time I’m doing a similar preparation.